On January 31st, France celebrated the ‘Nuit des idées’. 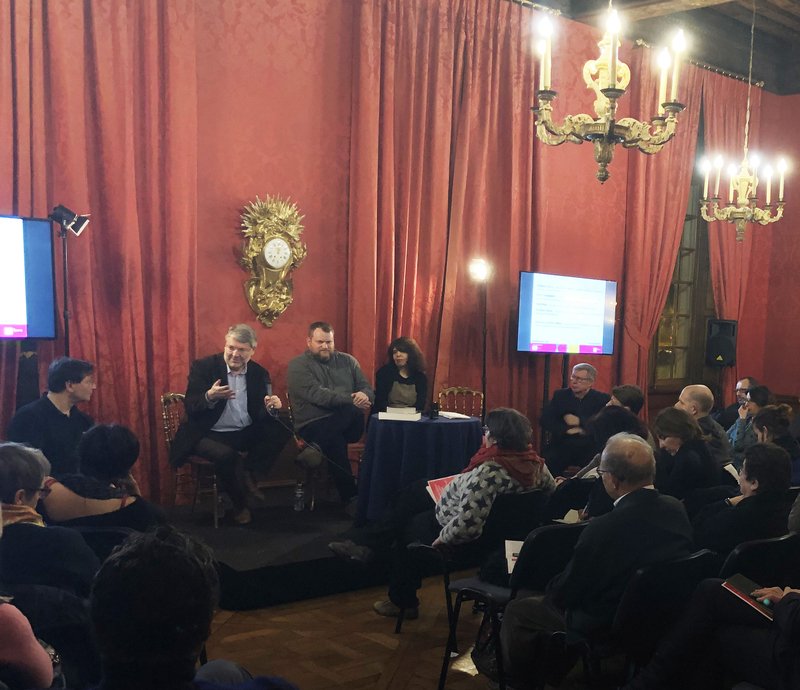 Now in its fourth year, this is a festival of public events designed to engage broad debate around all manner of ideas and issues, and it is celebrated all over France as well as in the various French cultural institutes in more than 70 countries around the world. 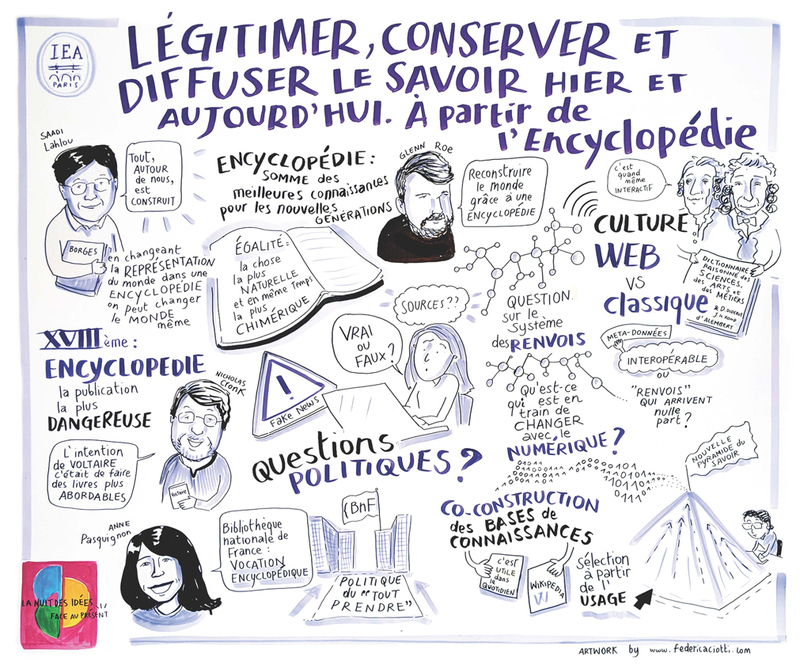 The theme this year was ‘Face au présent’, and the Institut d’Études Avancées (IEA) in Paris organised an evening of events to discuss how knowledge is legitimised and spread, from the eighteenth century to the twenty-first, from the Encyclopédie to Wikipedia. Saadi Lahlou, Nicholas Cronk, Glenn Roe, Anne Pasquignon and Jean-Claude Idée. Two roundtable discussions on the topic ‘Rassembler, légitimer et diffuser le savoir, hier, aujourd’hui et demain’ were chaired by Saadi Lahlou, director of the IEA. 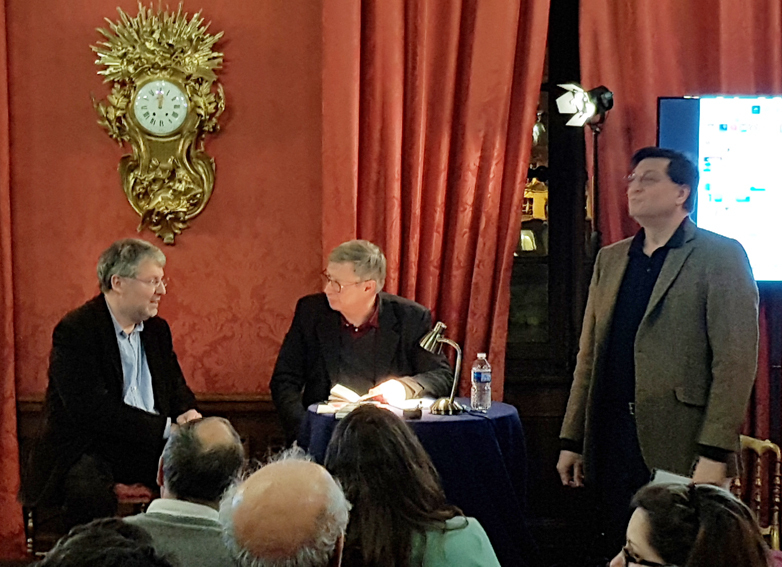 The first panel, made up of Anne Pasquignon (BnF), Glenn Roe (Sorbonne, and Digital Research Fellow at the Voltaire Foundation) and myself, talked in particular about the issues of classification that were problematic for the Encyclopédie and remain so today for the BnF. The second panel, devoted to the theme ‘Formes émergentes de construction et de partage des connaissances’, brought together Pierre-Yves Beaudouin (president of Wikimédia France), Dominique Cardon (director of the Médialab at Sciences Po), Primavera de Filippi (CNRS, and attached to the Berkman Center for Internet and Society at Harvard), and Charlie Danger (historian and archaeologist), who describes herself as ‘la première vidéaste vulgarisatrice féminine sur Youtube’). This being a ‘night’ of ideas, the panels provoked lively discussions that lasted until nearly midnight. Jean-Claude Idée’s aim was to offer the audience a chance to (re)discover a major work by Voltaire while bringing out its relevance to the present, and the performance was followed by an exchange between Jean-Claude Idée and myself, initiating a debate with the audience reflecting on the role of live spectacle as a means of transmission of ideas, and as an interactive pedagogic tool, for teaching literary and philosophical texts in schools: one teacher, for example, intervened to say that recordings of the Dictionnaire philosophique would be a powerful way to engage school students with Voltaire. Nicholas Cronk, Jean-Claude Idée and Saadi Lahlou. The performance and ensuing debate were certainly successful in taking an eighteenth-century polemical text and making it speak to and engage a modern audience. It also made me reflect on Voltaire’s own intentions in writing his Dictionnaire philosophique portatif. 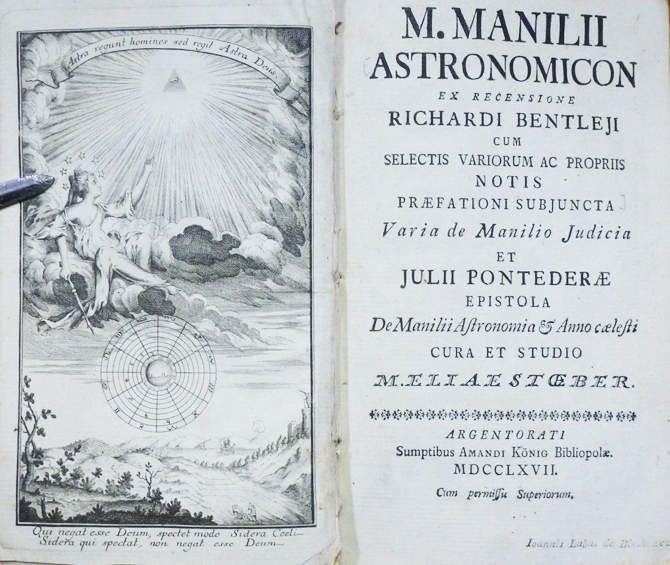 Publication of the Encyclopédie came to a halt in 1757, after the publication of volume 7, and when the Portatif appeared in 1764, no one knew when or if the remaining volumes of the Encyclopédie would ever see the light of day (in the event, they appeared all together the following year, 1765). So Voltaire’s Portatif – a title he uses in the correspondence (see for instance his letter of 1 October 1764 to D’Alembert, D12113) – is not just a response to the publicity generated by the Calas affair; it is also a riposte to the challenge of publishing a large encyclopedia in multiple folio volumes. The government could successfully censor such a large and cumbersome enterprise. But Voltaire’s Portatif – a Livre de poche ahead of its time – was easier to publish, easier to smuggle, and harder to censor effectively. Smaller books are faster to produce and easier to hide; and being cheaper, they can reach a larger audience. Voltaire’s response to the encyclopedic project does not of course end with the Portatif, for after 1770 it continues with the Questions sur l’Encyclopédie, published in 9 volumes over two years. This work has long been neglected, but the new critical edition, the first printing of the integral text since the eighteenth century, has now appeared in the Complete works of Voltaire (8 vols, 2007-2018), as described in Gillian Pink’s recent blog. As a follow-up to the Voltaire Foundation edition, a one-volume edition of the Questions sur l’Encyclopédie is due to appear in the Bouquins collection in April 2019. 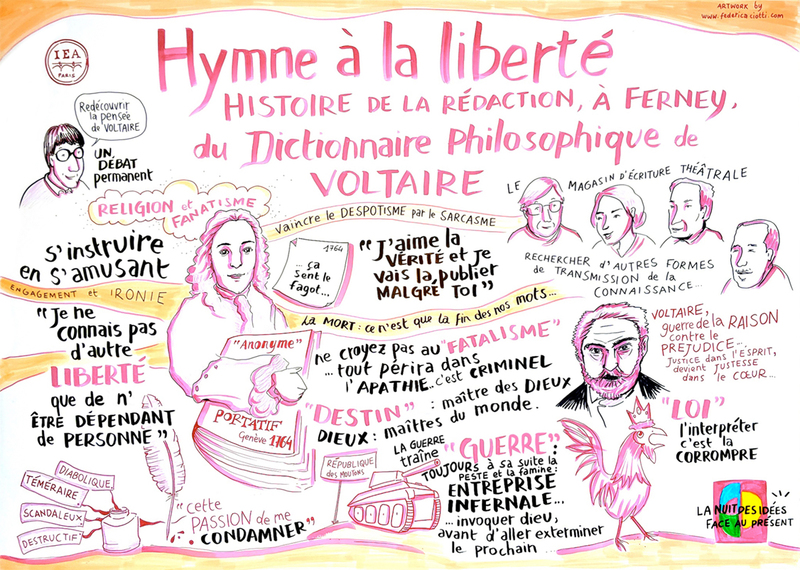 Jean-Claude Idée is planning a collaboration with the Voltaire Foundation to produce a spectacle based on articles from the Questions, and it will be enormously instructive to hear how the actors bring to life the Voltairean voices in these texts. The question of why Voltaire ceased revising the Dictionnaire philosophique after 1769, and turned instead to creating a new and longer alphabetical work, is not easily answered. One response might be to say that by 1770, when Voltaire enjoyed towering celebrity status, he was hardly concerned to say new things, but he was most definitely concerned to convey his message to a new and wider audience. And certainly one way to test this hypothesis will be to bring the articles to life in front of audiences and measure their reaction. We are currently finalising the programme for Digitizing Enlightenment IV, a day-long workshop that will take place on 15 July as part of the ISECS Congress in Edinburgh this summer. In order to expand our network of Digitizing Enlightenment projects and researchers, we encourage those working in any aspect of digital humanities across the interdisciplinary spectrum of eighteenth-century studies to attend the event, if in Edinburgh, or contact us for more information. Meantime below is the second post in our series of follow-up discussions based on work presented at the Digitizing Enlightenment III workshop. Eighteenth-century French salons have developed a mystical aura as sites of elite sociability and (more controversially) as potential workshops of Enlightenment philosophy. They were, however, ordinary face-to-face gatherings in many ways – not unlike unscheduled conferences and meetings with loose agendas today; the one consistent difference is that they were held in private homes instead of conference rooms and organized by individuals (normally women) rather than groups or committees. The nineteenth-century term “salon” grouped together a variety of meetings with certain characteristics: salons were held in private homes with relatively elite participants, conversation was the primary activity, and they occurred on set days and at times that were part of a larger social calendar. Aside from these very general characteristics, salons had a wide variety of purposes, publics, and activities. 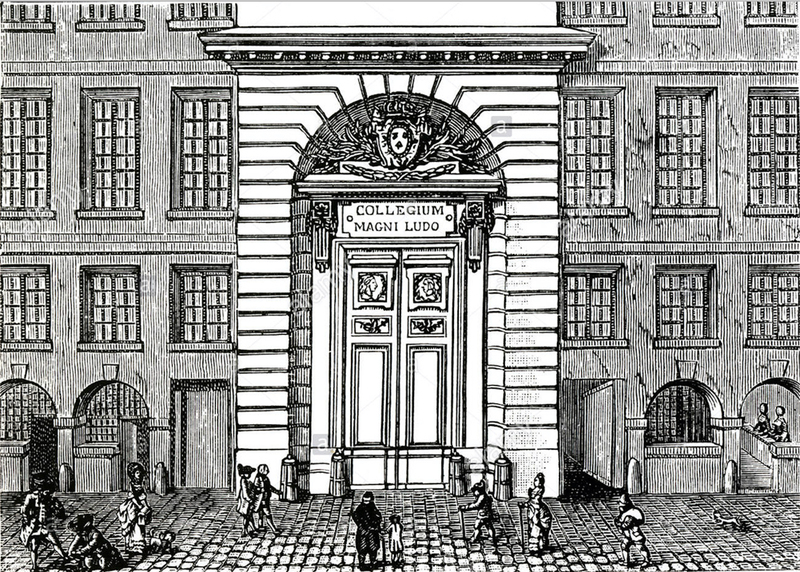 Niclas Lafrensen [Nicolas Lavreince] (1737-1807), A French salon. The most celebrated among salons, notably Tencin’s, Graffigny’s, Geoffrin’s, and Lespinasse’s, have become associated with great writers, philosophes, and mathematicians, like Voltaire and D’Alembert. Antoine Lilti has challenged the view that salons were primarily counter-cultural venues for philosophical debate, showing that the aristocratic traditions influenced notions of politesse in the salons and emphasizing the aristocratic habitus of many salon hostesses even when they had philosophes as guests. Disagreements over the character of salons may amount to differences more of degree than of type, since historians generally agree that the salons were mixed environments, but these debates do demonstrate the importance, now more than ever, of working through who was in attendance, in order to identify the social characteristics of eighteenth-century French salons. I am the co-director with Chloe Edmondson of The Salons Project, a database of primarily eighteenth- and nineteenth-century European salon participants. We completed our pilot project of French salons from 1700 to 1800 last year and have some preliminary results, which will appear in the volume Digitizing Enlightenment, edited by Glenn Roe and Simon Burrows, in 2019. As expected, we found a great deal of evidence for social mixité in eighteenth-century salons, including patterns of mixed gender, age, occupation, interests, and social status. We also found that both women and literary figures were present in all of the major salons, including salons like Deffand’s which were not known for their openness to the philosophes. We found that nobles were present in all salons, as were gens de lettres, and that these people were often one and the same. Our list of more than 600 salon participants is far from a complete record of eighteenth-century French salon attendees, but it is the largest and most complete database that we are aware of. The purpose of our study was not only to create a database, but also to create a method and a format for sharing data about salons and other informal networks. This method uses the robust data model created by the Electronic Enlightenment project, such that our data are compatible with the many other Enlightenment-era projects that are inspired by that database. We also use the schema “Procope”, which we developed along with Maria Teodora Comsa, Dan Edelstein, and Claude Willan to classify Early Modern European individuals, and which is described in our article “The French Enlightenment network”. 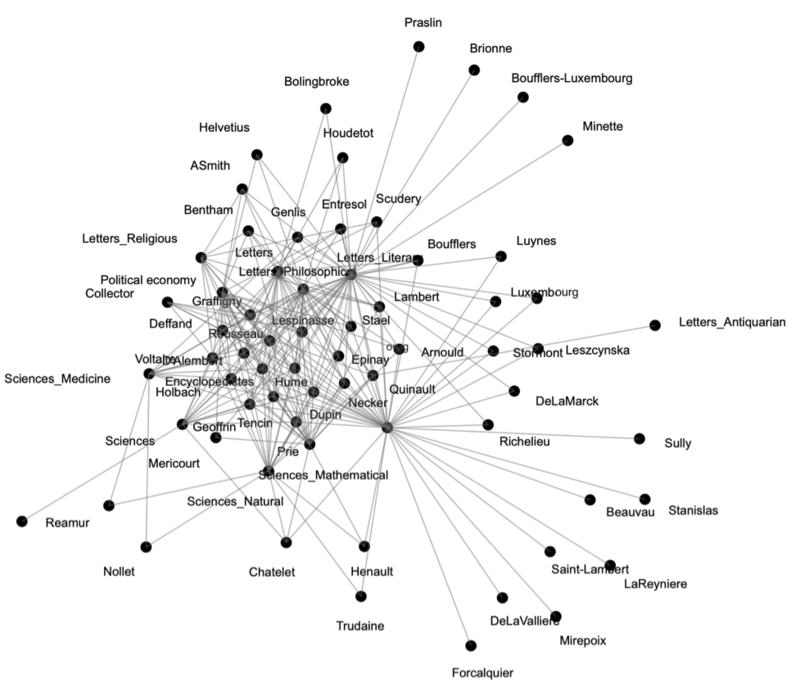 Salon, correspondence, and knowledge networks in French salons, 1650 to 1815 (data from The Salons Project, Conroy and Edmondson). Within our larger dataset (1650 to 1815), we found that the letters networks and salon networks remained well integrated, and that philosophes were a minority but well integrated into the core of the network (see diagram). 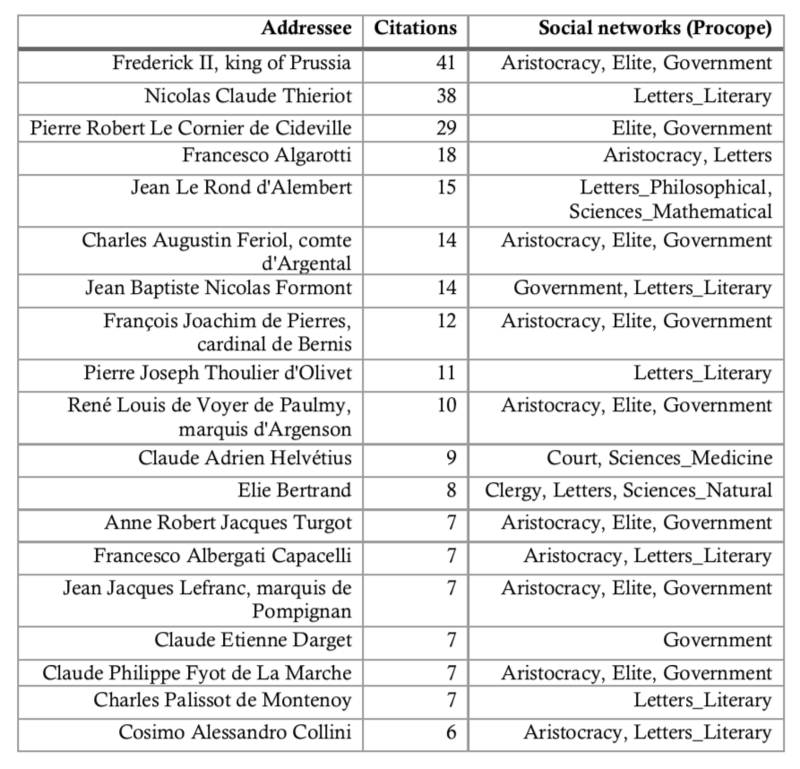 The most central figures are the ones whose networks are most associated with each field of knowledge (for example, Lespinasse’s salon is strongly associated with the “Letters_Philosophical” network, whereas Praslin’s is not; Voltaire’s correspondence network is more strongly associated with the encyclopédistes than is Necker’s; the Letters networks and “Letters_Philosophical” network are themselves tightly connected and central to salon networks). 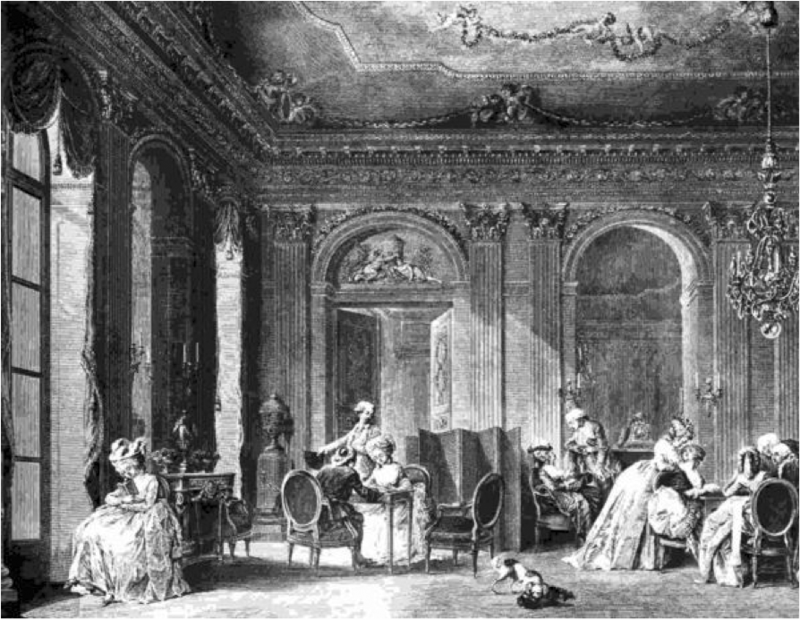 Whereas the best known salons of the era were well integrated into the letters and philosophical networks, it is important to remember that many of the salon attendees were not otherwise part of the French Enlightenment network, especially women, lower-status individuals, family members of other salon participants, and foreigners. 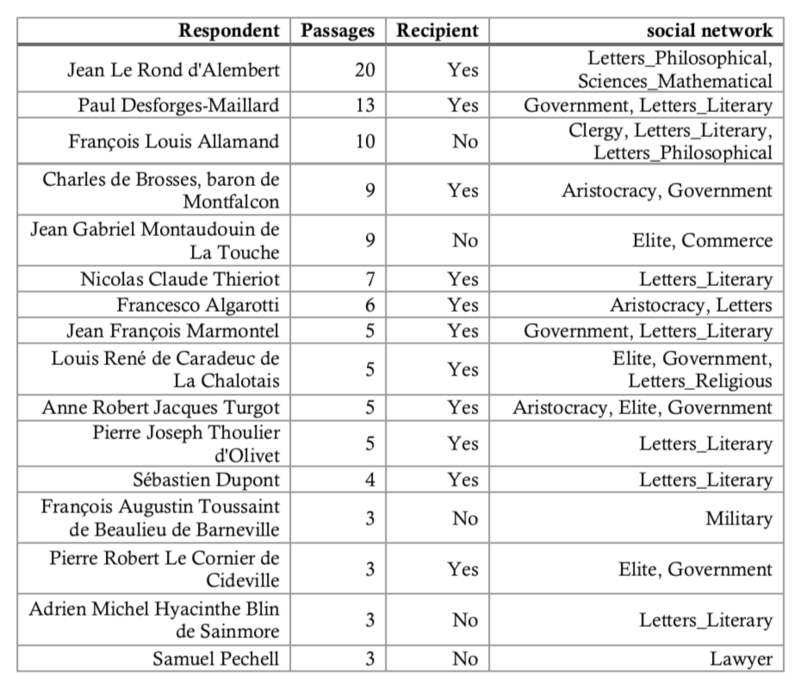 By adding these more marginal people to the records on eighteenth-century French sociability, we hope to open up new avenues for finding social relations that are not well known among these more marginal participants on the edges of the Enlightenment. 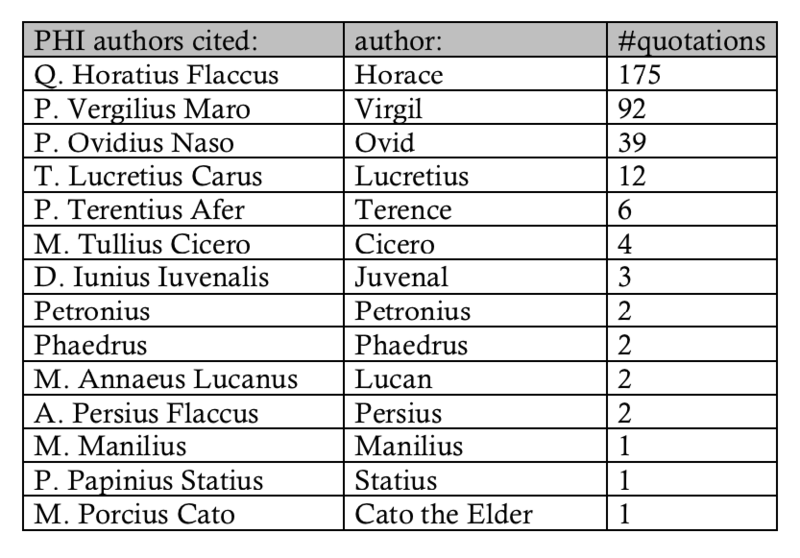 Even where we were not able to learn much about some of these more minor figures, including them in this preliminary dataset increases the chances that we will learn more about them in the future. Melanie Conroy is assistant professor of French at the University of Memphis and the co-director with Chloe Summers Edmondson (PhD candidate, Stanford University) of The Salons Project, a database of European salon participants. She can be reached at mrconroy@memphis.edu or @MelanieConroy. The Salons Project is online at salonsproject.org. The Salons Project is collaborative and invites new researchers to adopt its methods and share their data. However, scholars have only scratched the surface of religious belief in the Enlightenment. In Belief and Politics in Enlightenment France: Essays in Honor of Dale K. Van Kley, we dig deeper into the manifestations and impact of belief in France and its empire during the long eighteenth century. In their various ways, the contributors demonstrate how belief continued to show up in conversations, representations, and institutions, sometimes in unpredictable ways. They find the persistence of religious belief at the heart of social, cultural, and political life well into the nineteenth century. 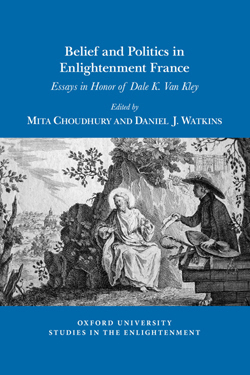 Belief and Politics in Enlightenment France: Essays in Honor of Dale K. Van Kley, edited by Mita Choudhury and Daniel J. Watkins, is the latest volume in the Oxford University Studies in the Enlightenment series. At the center of our investigation is the Catholic reform movement known as Jansenism. Active throughout Catholic Europe, Jansenism found a home in France and impacted ecclesiastical and political life in dramatic ways. At first glance, the penitent and rigorist sensibilities of Jansenists seem far from the progressive and worldly predilections of enlightened philosophes. A deeper look, however, reveals how Jansenist belief contributed to a host of social and political reforms including the critique of absolute monarchy, the promotion of religious toleration, and the articulation of the rights of the citizen and the rule of law. Jansenists present historians with examples of intensely devoted Catholics whose religious beliefs contributed to their engagement with the political public sphere. Jansenism, however, did not exist in a vacuum. Throughout the long eighteenth century it competed with other voices in the Church over what it meant to believe in an enlightened age. The conflicts wrought by Jansenists and their internecine nemeses, the Jesuits, dominated political conversations in France certainly until the latter’s expulsion and suppression in the 1760s and even after. The tensions between these groups involved disparate ways of reconciling traditional religious beliefs with new epistemologies. In their disagreements about such matters as human nature, society, and politics, they both articulated forms of enlightened Catholicism that competed with one another throughout the eighteenth century. 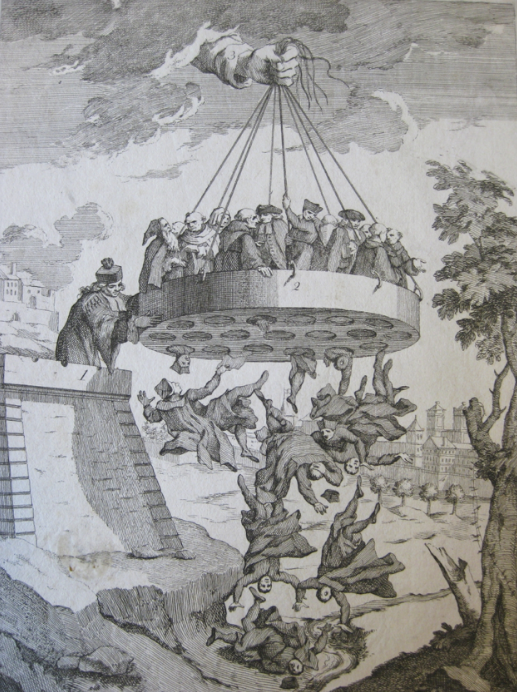 An anti-Jesuit polemical image showing members of the Jesuits falling through a sieve held by God and shaken by a member of the French parlements, judicial bodies in the Old Regime. The centrality of this conflict in the conversation about belief and its manifestations during the Enlightenment owes much to the work of Dale K. Van Kley, whose scholarship this volume honors. His work over the past four decades has provided the foundation for all of our contributors’ investigations into French religious life. Van Kley has shown that the competition between Jansenists and the partisans of the Jesuits defined religious culture in France and consequently played a formative role in shaping how belief impacted political and social institutions during the Enlightenment and well into the revolutionary era. The persistence of the Jansenist–Jesuit struggle complicates the long-standing narrative of France’s progressive secularization beginning in the eighteenth century. It sheds new light on the way that we frame the Enlightenment’s connection with secularization and, therefore, modernity. Amidst increasing voices calling for the separation of social and cultural life from the auspices of the Church, many continued to see religious belief as not only a part of their identities but also an important tool for navigating the social and political spheres of the modern world. For an example, see the work that Alan C. Kors has done on the history of atheism in seventeenth- and eighteenth-century Europe: Alan C. Kors, Atheism in France, 1650–1729, vol. 1: The Orthodox Sources of Disbelief (Princeton, NJ: Princeton University Press, 1990); Naturalism and Unbelief in France, 1650–1729 (New York: Cambridge University Press, 2016); Epicureans and Atheists, 1650–1729 (New York: Cambridge University Press, 2016). 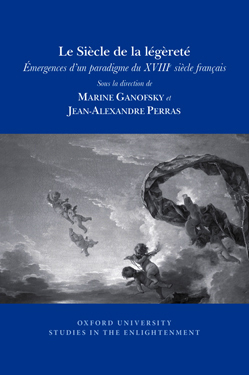 Belief and Politics in Enlightenment France is part of the Oxford University Studies in the Enlightenment series, published in collaboration with the Voltaire Foundation, University of Oxford.